Today we’re pleased to announce the release of collections. Collections are a way to create custom lists of posts. It works almost exactly like starring a post. Our users found many creative ways to use their starred posts list: like keeping track of important entries or saving for later reading. We wanted to embrace that creativity and make it possible to do even more great things. A collection is just like a regular list of posts, but you decide what to be added and when. 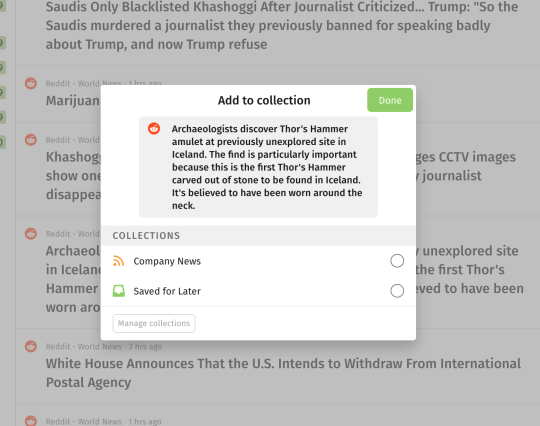 Collections appear in your lists of feeds and folders, and can be moved into folders or sorted as you like. Name them after their purpose, and add an icon that helps you quickly identify them. Right-click, or press the keyboard key P, on a post, and choose what collection to add it to. By itself it’s a great way to organise posts you want to save for later. But combined with our other productivity tools, the possibilities become endless. Feeder Pro and Feeder Business users have access post actions. Post actions let you take action on posts matching criteria you define. An action can be “Mark as read” or “Mark as starred”. With this release we added a new action: “Add to collection”. Simply, if a post matches your filters, add it to the chosen collection. It’s incredibly powerful. For example, take a high-volume feed like NYTimes.com, and add an action to add posts matching “Climate change” into one collection for Clime Change related entries, and add another action for posts matching “Elon Musk” into an Elon Collection. With Feeder Business can share a collection just like you can share any feeds or folder. User A creates a collection, and shares it with her team. When User A adds a post to the collection, it’s treated as any new post in the system. Notifications are triggered, e-mails are sent and unreads updated. With Collections and Feeder Business, teams can assign designated moderators to moderate an incoming stream of information. They can act as gatekeepers that forward updates to the relevant department or person, helping them stay focused. Post collections are available for all Feeder Basic, Feeder Pro and Feeder Business users. The productivity tools mentioned are still only available for Feeder Pro and Feeder Business users. So try Feeder Pro or Feeder Business today and see how it can help you work smarter.